Appearance: Of average height and girth, Kinkuzo wears what appears to be a standard black shinigami kimono, with a Shinigami Technological Institute robe worn on top. His face is generally concealed by a welding mask with a green-tinted lens, but his eyes would appear to be green, with heavy eyelids. A slightly concave nose completes his face, albeit one that is seen more and more rarely as time goes by. When his expression is seen, it tends to be tired to the point of apathy, sour and frowning, or graced with a rare grin at a particular bit of sarcasm. His hair is greasy to the point that identifying its colour would be impossible, though one of the more experienced members of the Shinigami Women's Society has suggested it is most likely a dark blonde. Not that any of them have expressed interest - Kinkuzo is antisocial to a fault, making no effort to maintain relations outside or in his already introverted squad. By far the most distinctive aspect of his appearance, however, are his legs. Early in his career, Kinkuzo lost a leg in combat with a hollow of varying power depending on who is telling the story, and used his skills as an engineer of 12th Division to replace both with artificial replacements, steel-and-wood constructs more akin to backwards-jointed frog legs than human ones. Rumours that Kinkuzo plans to replace more of himself with the perfection of a machine remain, he unconvincingly insists, unfounded. Personality: Although as antisocial as the rest of his division, Kinkuzo tends to handle himself better in social situations than most of them, thanks to a black, surreal, and occasionally inappropriate sense of humour. His quick temper is well known in the engineering workshops, and many a crash or small explosion is followed by his storming out, cursing wildly, before going and fuming at something. Kinkuzo has trouble admitting he's wrong, with the tenacity with which he holds onto his "rightness" only increasing the longer the dispute goes on. Kinkuzo considers his engineering an art rather than a science, often willing to settle for measurements or equations that "look about right", and make leaps of logic based on intuition or aesthetics. This is an attitude that often irritates his fellows (especially Kuso Kessen, the 3rd Seat of the Division), something not helped by the fact that he's so often right. While the importance Kinkuzo gives to ethical considerations has gradually lessened over the centuries, those few he holds onto are genuine beliefs, which he avoids violating in the course of his work. Lately, he's been showing something of a transhumanist bent. In battle, Kinkuzo uses whatever bizarre gizmos he has on hand to end a combat, before switching to his zanpaktou when things get hairy, generally releasing as soon as possible. Although in the past he favoured a style based around avoiding the enemy, since his injury he has focused more on close combat. He has spent a stint in 2nd Division training to learn some kicking techniques, made especially dangerous by the capabilities of his new legs. 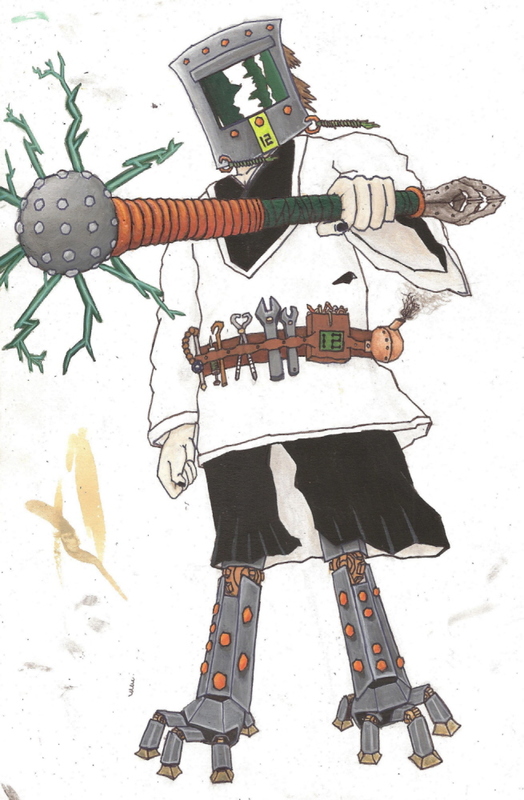 Once somewhat proficient in kidou, his injury or possibly his prosthetics resulted in a block that leads to most of his spells simply fizzling out, to the point that he's all but forgotten how to use it. The Zanpaktou appears to be a cross between a tesla coil and a mace. As well as possessing a heavy, blunt top to strike opponents with, nearby objects and people are zapped by green-tinted electricity springing from the Zanpaktou. The shaft has a dark green leather-wrap grip, with two steel toad-feet on the end of the shaft, clasped as if in prayer. The Zanpaktou grows enormously in size, becoming impossible to wield normally, while the orb on top of the tesla coil takes on the appearance of a giant toad's head. The very bottom of the coil itself is covered by a thick, studded belt and scale-mail skirt, with metal toad-legs poking out from beneath. Constant rings of electricity surround the coil and its wielder, severely damaging anyone who touches them. The wielder himself stands or crouches in the toad's mouth, directing a number of metal "tongues", which he may use to entangle and shock the foe, or to conduct some of the the electricity that surrounds him into focused lightning strikes. Last edited by Revlid; 2009-08-16 at 05:30 PM.